Our Christian education program is comprised of two parts: Adult Christian Formation and Sunday School. Two of our adult programs occur on a weekly basis. One is in the format of a lay-led Bible study, which takes place on Thursday mornings, the other is a weekly evening class, comprised of discussion of a book related to faith and led by our now-retired associate priest. This concludes each week with Compline. In addition to these two regular programs we also offer adult classes, usually connected to the church calendar, which are seasonal, and shorter in length. During Lent, we walk the Stations of the Cross weekly, as well as offer a book discussion, and this year we are introducing an evening Advent program. Our children’s program is small, but varied and vibrant. We have one large class for children between the ages of 10-14 (or 5th through 8th or 9th grade) which is held during the 10:00 service on Sundays. Students in 9th grade can attend a confirmation class, which is held by the rector, and which also entails the pairing of each confirmand with a mentor (adult parishioner) for further study. As is the case in so many parishes, we have historically seen a dramatic drop in the attendance of our students once they have completed the confirmation process. Three years ago, in an effort to change this pattern, and to help our youth feel more connected to the church, we began a practice of having them in church once a month as active participants in the service. They are lectors, ushers, greeters, and read the Prayers of the People, along with serving as acolytes and chalice bearers. 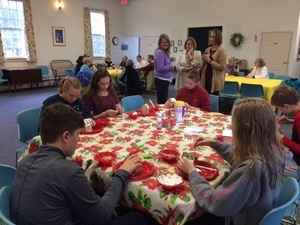 They are supervised in these roles by parishioners who perform them regularly, which has the added benefit of creating an intergenerational bond between the young and the not-so-young. This seems to be having a positive effect, as we now have students who were recently confirmed stepping forward as young adults to assume these roles in our regular services. We meet approximately twice a month in the classroom, where we present lectionary-based lessons generally taken from the gospel message. We also try to do a monthly group project, which focuses on liturgical or seasonal messages (John 3:16, Christian pumpkin carving, making dioramas of the temptations of Christ when he was in the wilderness, etc.). As for the youngest set, two of our parishioners are trained in Godly Play, and this is offered as well. The fact that our church has three services, and that children regularly attend two of them, is not lost on the Christian education teachers. We make every effort to involve children who are not consistent attendees of the Sunday service in church events. We also periodically try to offer an intergenerational service on Saturday night which combines the Saturday night and Sunday morning students. On these occasions, a special event which is informative and educational to all is planned and combined with a pot luck supper. These services have been as popular with the older parishioners as they have been with the youth. Yes, our Sunday School is small and we would all celebrate an increase in class enrollment and attendance. However, regardless of size, we make great effort to keep our youth active and engaged in our church life.